slovakian artist roman ondák’s project is a living infographic, a plotting of visitors’ heights whose mean will become increasingly apparent over the four months at the temporary stedelijk. 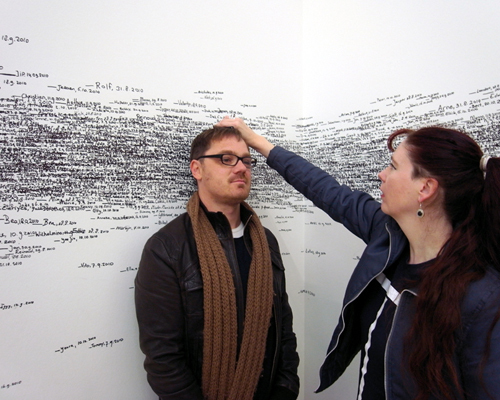 when we visited the exhibition, participants’ names were still readable, but already there was some overlap. soon there will be nothing but a dense black line circumscribing the room and only the outliers’ names will be legible. in some ways, ondák’s work reflects the great challenge of the museum as a vehicle of history. individuals must and will emerge, and artists will resurrect and bring to the surface those narratives marginalized and forgotten by the nation or the institution. the interactive work by roman ondák is a part of the current exhibition, ‘taking place’ at the temporary stedelijk (the stedelijk museum amsterdam). by addressing its history, the spatial and temporal conditions of the unfinished building and the ways in which artists use, occupy and animate museum spaces, ‘taking place’ shows works by local, national and international contemporary artists, who range from well-known and established figures to emerging artists. I love this. At first glance I thought it was a Richard Long installation, but it turns out to be the remains of human activity as opposed to the natural world. Just as poetic.